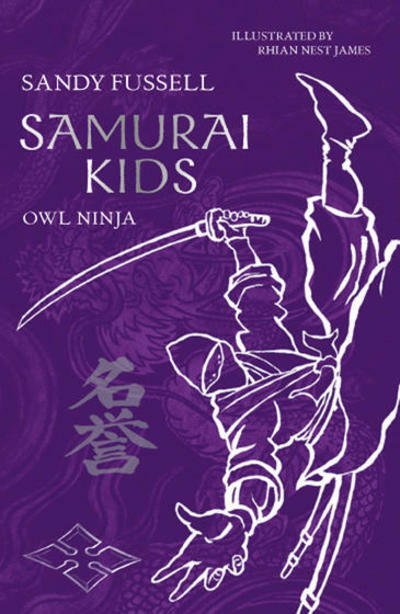 The first book in this series is Samurai Kids: White Crane. This is the second book, and the series is fully written. I know (because of talking to Fussell and her editor, Sue Walker) that White Crane was originally a standalone book. Sometimes, an author makes a wonderful, shining, unique thing and is then asked to write a sequel – and the sequels are all merely good. This hasn’t happened here. If anything, Owl Ninja is even more shining and wonderful and unique than White Crane. The story begins as war is about to commence – a war that will involve large numbers of Samurai kids from the various ryu schools. Sensei Ki-Yaga and his students of the Cockroach Ryu set out on a journey to the emperor to ask him to prevent the war. The evil and ambitious Dragon Ryu leader sets out to stop them. And there’s one more problem: Sensei Ki-Yaga has long since been sentenced to death by the emperor, and risks his head to face him. The story is great, the action is good, and the characters shine. Illustrator Rhian Next James is lovely, too. Despite all the tension (and the real risk of violent death), these books have an unwavering core of friendship and love that makes even me believe the world is filled with goodness and peace and hope for as long as the book lasts. But as always, the thing that takes this book from fantastic to sublime is the style. The only way to show you what I mean is to show you what I mean. A samurai’s sword is his most treasured possession. He wears it on his belt but he holds it against his heart and it sings into his soul. My sword shines bright and sings loud enough for Onaku to hear. Even now, when it should be listening politely. We’re all paying close attention now. The point of a sword is very sharp. Carefully, I draw the blade and pass it to the Sword Master. I keep the cutting edge inwards because if I overbalance and fall, Onaku might be killed. opens a screen door, delicately painted with samurai battle scenes. All the warriors have Onaku’s face but none of them have his stomach. Mrs Onaku is a skilled painter and a loving wife. Onaku knows how lucky he is. “You talk to ghosts?” Kyoko’s mouth drops open.